Once Again, It's Texas Thoroughbred HBPA, Inc. Board of Directors Election Time! Click here to see Thoroughbred owner and trainer candidate biographies and photos. If you are currently a member in good standing (i.e. ; currently licensed by the Texas Racing Commission, have started a Thoroughbred racehorse in the past 12 months and own at least 5 % or more of a Thoroughbred racehorse) of the Texas Thoroughbred HBPA, Inc. you will receive a voting ballot for the Thoroughbred candidates. When voting for the Thoroughbred representatives you may for vote for no more than two (2) Owner and one (1) Trainer representative. If you do not receive a voting ballot within the next two weeks, please contact Wanda O’Banan at (512) 467-9799 in the Austin office. 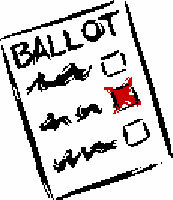 Ballots must be received in our office no later than Monday, December 13, 2004 and meet the bylaws requirements in order to be valid and be counted. The mailing address is located on the enclosed return envelope in the voting packet. Coming Soon! For those of you that are current members and participate in Quarter Horse and Paint racing, the Texas Horsemen's Benevolent and Protective Association's Board of Directors 2005 Election voting ballots will be going in the mail no later than Wednesday, November 24, 2004.